Find out how to keep your molds clean, and so much more! Slip casting opens up endless possibilities for creativity with clay, whether you are interested in casting clay sculpture or pottery. But it can also be an intimidating process for the beginner. So we are trying to create a reliable collection of information on the slip casting technique on Ceramic Arts Network. 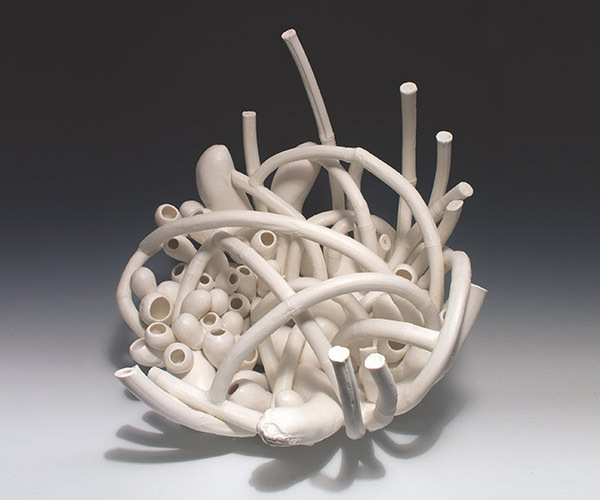 Today, ceramic artist Valerie Zimany explains how to make a casting slip out of the clay body she uses and gives some handy tips to remember when casting clay sculpture and pottery. Not only are these tips helpful to the novice, but those who have experience casting clay sculpture or pottery will also find it useful. – Jennifer Poellot Harnetty, editor. A mold need not be “pretty” as long as it casts cleanly, but sloppy molds will cost more in terms of time and trouble. Do the mold right the first time and it will last through many cycles of casting. After casting in plaster, round off the edges of molds with a surform (to prevent small bits of plaster from breaking off and getting in your slip, recycle, etc.). Wipe down molds with vinegar and water (use a 1:1 ratio) to clean off excess mold soap using a soft toothbrush or sponge. Wet and sand your molds all over with at least a 600 grit wet/dry sandpaper. This will make the outside of your molds slicker and simplify clean up of slip dribble. Why is my mold growing a beard? A mold that is grows a fuzzy white beard is a mold that is getting old and is most likely very worn out! This phenomenon is particularly common with sodium silicate. With repeated castings, the sodium silicate in the casting slip will work its way through the capillaries of the plaster and form crystals on the surface. Wiping the mold down with a vinegar/water solution can help clean it, but your mold may be reaching the end of its usefulness. Generally, Darvan is a little easier on molds than sodium silicate, and can help your molds last longer (though it must be used in a higher ratio and is more pricey than sodium silicate). Long a staple of industry, gang molds are a great method for casting clay sculpture or pottery. This method allows you to spend less time making molds, will speed up your production of multiples and will give you consistent results from one cast to the next. Gang molds can easily be both one or two-piece molds and can share the same sprue hole. The mold is made in the same way a single object mold is created but several objects will be placed on the initial clay bed at once. Be sure to allow for an ample amount of space between each object, approximately an inch of plaster so there will be sufficient absorption of water from the casting slip. The rest of the mold will be made and cast similar to single object molds. *For cone 10, use Custer feldspar instead of nepheline syenite. The water should be no more than 50% of the total weight of the dry materials. Darvan should be 0.4% of total weight. Bentonite should be 0.5% of total weight-up to 1% if desired. 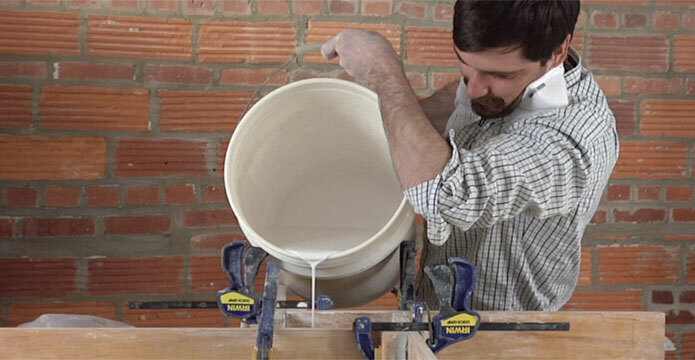 A batch of 10,000 grams of dry materials, when mixed with water, makes about 5 gallons of slip. Blunge water and Darvan with a heavy-duty drill and a squirrel-cage or jiffy mixer. Add the bentonite and continue blunging until thoroughly mixed. After mixing thoroughly, add up to 18g (0.2%) more Darvan (no more than 0.6% total) as needed. Small amounts of water may also be added to improve viscosity (use drops of water at a time and go slowly). Check the specific gravity of the slip. Specific gravity is the measure of the density of a substance. For liquids, we compare the density to water. Weigh a specific volume of slip and divide that weight by the weight of the same volume of water. The ideal result should be 1.7-1.8. This means that the slip is 1.7-1.8 times as dense as water. Most good slips are in the 1.75-1.78 range. Let the slip stand overnight (or continue mixing overnight if you have the equipment to do so). Mix once again the next day and recheck specific gravity before using. It is possible to use the slip right away, but waiting helps to insure all particles are thoroughly wet. As you mix, try to avoid causing a multitude of air bubbles by going too fast-the bubbles can get trapped in your slip and reappear in your castings. bentonite, blunge, breaking, clay, custer feldspar, darvan, macaloid, sand, slip, slip casting, soap, solution, specific gravity. how are some ways you can get cool effects on your work. how can you keep bubbles off you pottery when you are glazeing?